I was looking through my videos and came across one I forgot about from August. 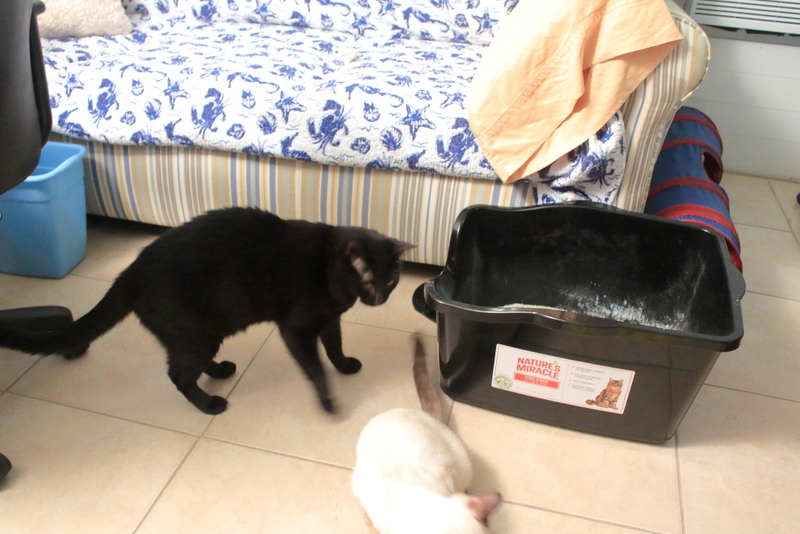 Puck either caught a lizard in the litter box or moved it to the litter box so he could play with it without losing it. Whatever the reason, he drew a crowd of spectators. This entry was posted in Uncategorized and tagged Cats, hunter, Litter box, lizard on January 23, 2017 by Charles Huss. 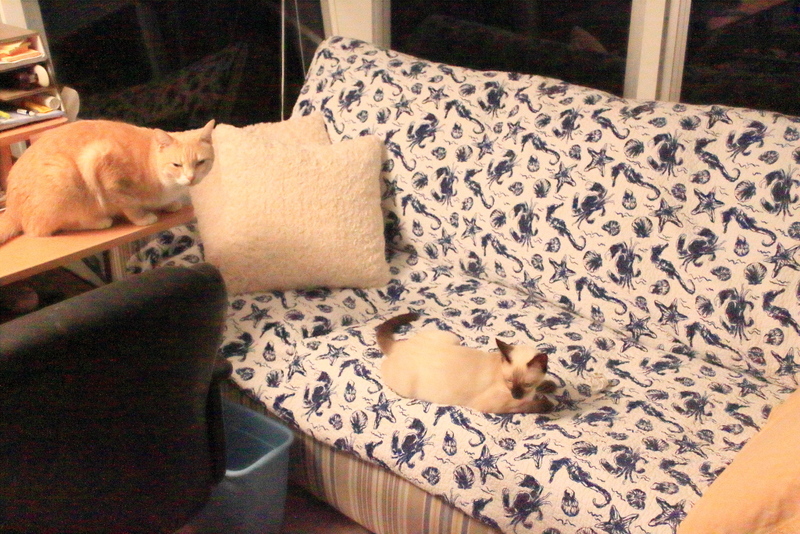 Puck has been pooping on our sofa in the “cat’s” room. At first we blamed Chris because that is something Chris would do but we soon realized the the evidence started pointing to Puck. We bought another litter box (see here) because we assumed the boxes were not always as clean as they should be after adopting Floki. That worked for a while but soon we found poop on the sofa again so I moved the new box next to it to see if that would help. A day or two after putting the box there, I think it was Saturday, Rose was at her desk when Puck decided to poop on the couch. Keep in mind that her desk is inches from the couch but she felt compelled to call me in from another part of the house to stop what was going on. I arrived just in time to see the event unfold in real time. There wasn’t much I could do at that point. If I was there from the beginning, oh, like maybe sitting in a chair next to him, I could have picked him up and put him in the box. The funny thing is, we never new for certain that Puck was the culprit, but he showed us he was guilty in a big way. At this point, I don’t know what to do with him. I have a bottle of Nature’s Miracle Calming Spray that I bought for a problem long ago but I can’t remember what that problem was. In any case, I sprayed it on the sofa this morning and Frankie and Floki became very interested in the smell. I also have a bottle of “No Scratch” spray, which I think is like a repellent, but I don’t want to repel the cats away from the sofa. I hope the calming spray helps because I don’t know what else to do to get puck to poop where he is supposed to. 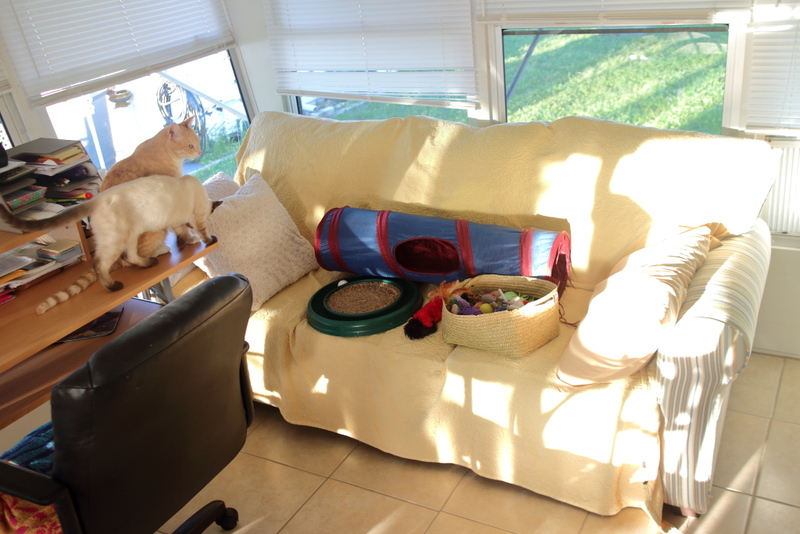 Maybe next I can put the litter box on top of the sofa. My wife would love that. 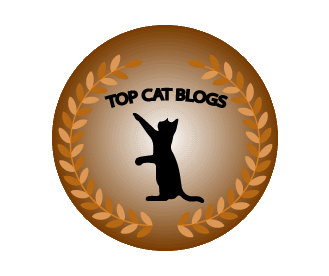 This entry was posted in Uncategorized and tagged calming spray, cat, couch, Litter box, pooping problem, sofa on September 26, 2016 by Charles Huss. The idea that those covers control odors, in my opinion, is a fallacy. They may somewhat contain the odors inside the box, in concentrated levels, that the cat then has to endure every time they use it. In addition, all those smells are released all at once when you remove the cover to scoop. I have seen my cats use the litter box without the cover and they will almost always have their head in a position outside where a cover would be, indicating to me that the cover interferes with what is comfortable for them. We eventually switched to larger boxes, in part because we had too many cats, but also because I felt the standard litter box was too small and confining. Cats like to choose a good spot to go in and I felt the cats would feel better if there were more room to find that spot. At first, we bought big storage boxes. These worked well but when Chris came along and started pooping outside the box, I spent many years refining our litter boxes, and the litter itself, to get him to poop where he should. Another thought had been that the boxes were a bit too tall and climbing into a box is probably not natural for a cat. With that in mind, I replaced the boxes with ones that were a little shorter. 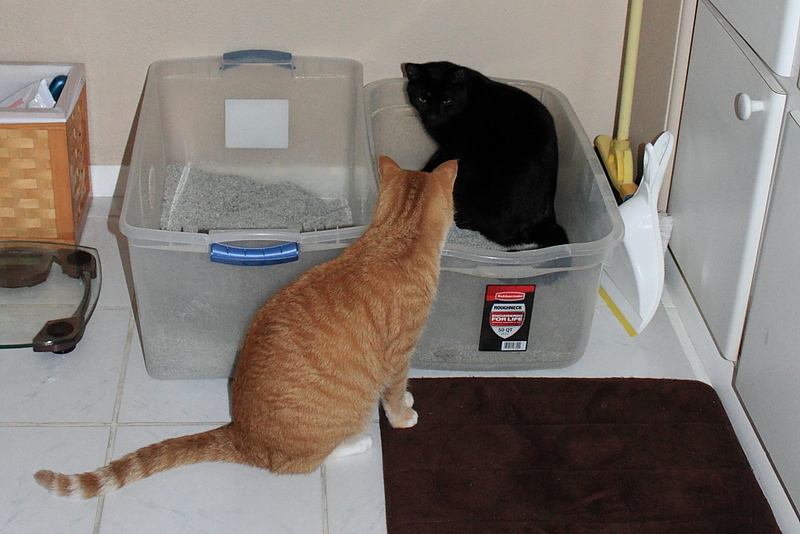 I also bought an actual litter box that was short enough so Chris could just step into it. These changes helped but they were not enough. Just recently we purchased two litter boxes. One was fairly big with a low front for easy entry. Our most recent purchase was a huge litter box called the Giant Litter Pan that is also lower in the front and it has two pockets for the scoop, bags and whatever else you need there. Of course, the right box is only part of the solution. The other thing to consider is litter. 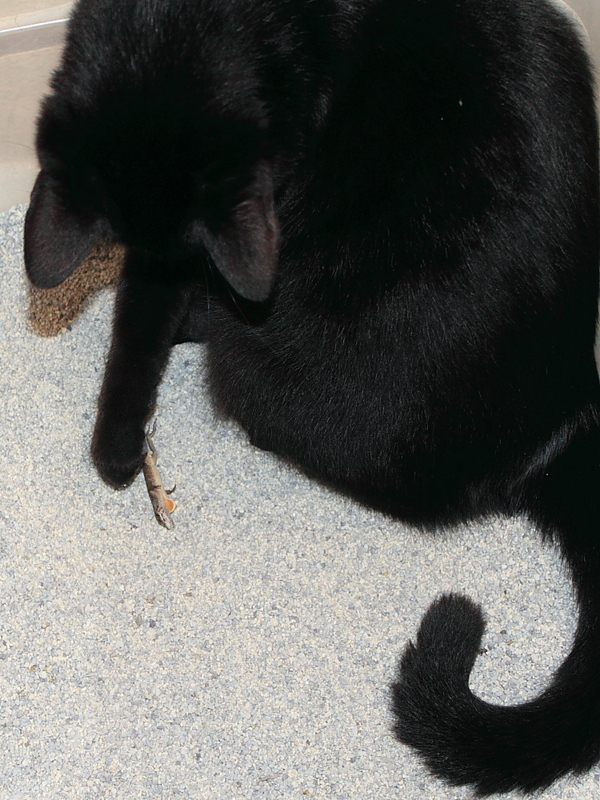 Litters that are dusty are not good for humans or cats. 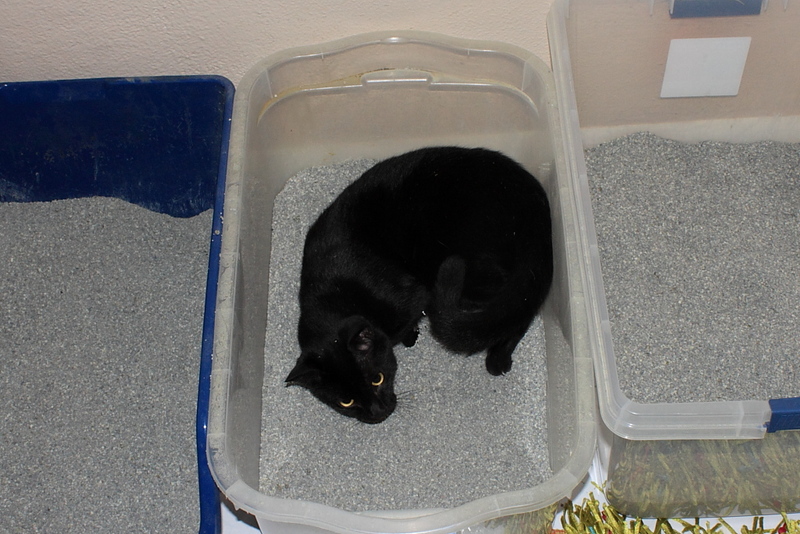 I tried many litters and, at least for a while, settled on Tidy Cats because it had a relatively low dust. The Tidy Cats worked well enough but it did not stop Chris from pooping on the floor. What helped that was a litter called Dr. Elseys Cat Attract. This litter has an attractant that somehow makes the cats want to use it. The drawback to this product is the cost, at about $30 a bag. It also did not work 100 percent of the time, however, the number of poops I had to clean off the floor was reduced by at least 80% which made this well worth the extra cost. It is also even less dusty than the Tidy Cats. Chris’s pooping problem was eventually eliminated when we moved to our current home and put our three litter boxes (now two) in the same room. We had them in different rooms so Chris would always be close to a box but I see now that was a mistake. If one box was not perfectly clean in the old house, Chris was not going to go to another room to check out the next box. He simply pooped on the floor. Now if a box is dirty he can just step over into the other box to do his business. Precious Cat Ultra Litter Attractant and can be purchased separately) and the higher cost. It is still not cheap but it is very low dust and is also unscented, which I think is good because the perfumes added to litter is just one more thing intended for humans that a cat does not need. Now I spend a little more time scooping and sweeping litter but I consider that time well spent. It is way better than cleaning poop off the floor. 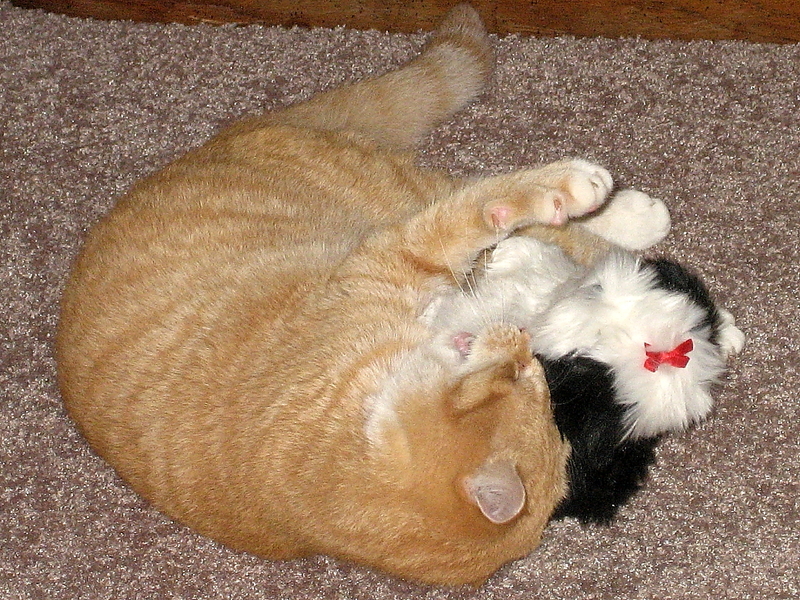 This entry was posted in Uncategorized and tagged Cats, litter, Litter box, odors, poop on May 10, 2014 by Charles Huss. 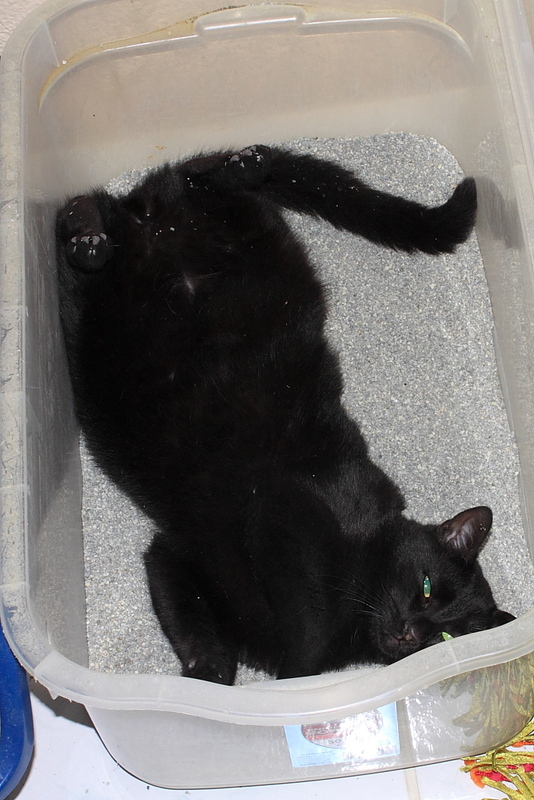 Lately we have noticed that Puck seems to want to roll around in the litter box. At first we thought he was just being weird. It would be like us humans washing our hands in the toilet. But then we discovered it is common for cats to do this. 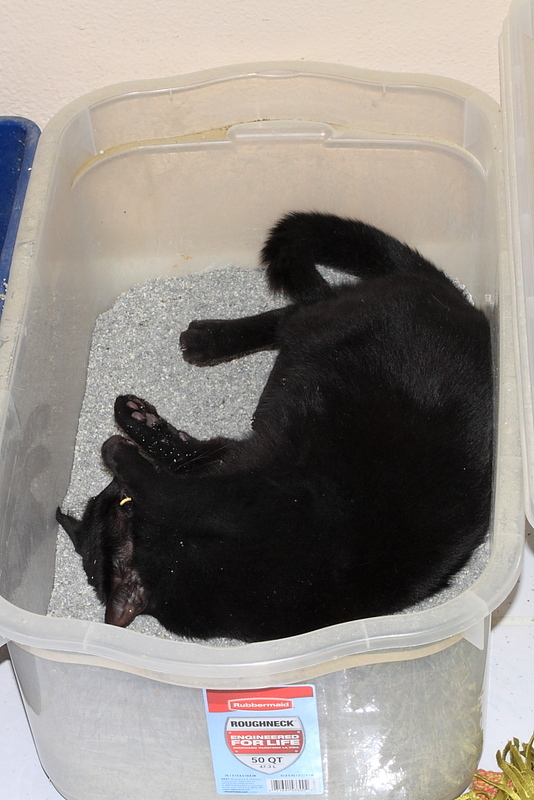 It is called a “dust bath” and naturally, this is supposed to be done in the dirt, but our inside cats have no access to dirt so this is the best they can do. One of the reasons they do this is to cover their bodies with good bacteria that they then lick off themselves to get this good bacteria into their digestive system. They may also do this to scratch an itch or mark their territory. My worry is that the bacteria in the litter boxes may not be what I would consider good, although so far Puck seems to be in good health and is on the desk as I type this purring and causing typos. This entry was posted in Uncategorized and tagged cat behavior, dust bath, good bacteria, Litter box on April 2, 2014 by Charles Huss. Since the day we got Chris we had to deal with him pooping on the floor. Usually he would poop in the box but sometimes he would poop on the floor or the bathtub. It was a difficult struggle with him and we finally got some relief with a special litter called Dr. Elsey’s Cat Attract. This helped a lot but I still had to deal with an occasional poop on the floor. Nick came just before Christmas and spent a week with us. He couldn’t handle Chris annoying him while he was trying to sleep so instead of closing his door, he put Chris on the patio and locked him out of the house… without a litter box. He may have tried to close his door only to have Chris flick the handle up and down, I don’t know. What I do know is Chris had no choice but to poop on the patio, and he did. Like an alcoholic taking that first drink after months of abstinence, Chris found it hard to stop. Several times since then I have found poop on the patio. Yesterday morning I was late leaving for work because I had to clean three piles of poop on the patio. It has been several days since we spent time on our patio so I guess it was accumulating. Fortunately it is not everyday that he does it and he hasn’t brought the problem into the house yet. Rose wants to put a litter box outside but I want to first work on trying to stop the problem. I have cleaned the area very well and somewhere lost in the house is a bottle of no-go spray. It hasn’t been very effective in the past but it may help a little. Does anybody else have a suggestion that might end this? This entry was posted in Uncategorized and tagged cat, Litter box, pooping on floor on January 16, 2014 by Charles Huss. The title may be exaggerated but lately it seems like I find the cats playing with a lizard almost everyday. Sometimes it happens more than once in a day. I can only guess that they come in under the patio door, Chris or Puck finds them, asks them nicely if they want to play, and when hearing no reply (lizards can’t talk silly) bring them into the house for fun and games. It always seems to be a group event. Apparently they think they are pack animals like wolves. This past week I had to dislodge three lizards from either Chris or Puck and put them outside. A couple more times I was too late. The other day I walked by the bathroom and noticed Puck in the litter box and Chris standing next to it as if he was waiting his turn. Upon further inspection I noticed that Puck had brought a lizard into the box. I was too late to save it and I am not sure if it was a ceremonial burial that I interrupted. Hurry Puck! If they find it we will be in trouble. I am burying it as fast as I can. This entry was posted in Uncategorized and tagged burial, Cats, hunters, Litter box, lizards on October 1, 2013 by Charles Huss. The first night with Chris was rough. Actually, every night for the last two and a half years have been rough, but we were not prepared for Chris at that time. Normally our cats would gradually filter into our room at night and congregate on my side of the bed, eventually taking up about a third of the space, That was the biggest problem we had no deal with. Suddenly, we had a five and a half month old kitten who loved to bite. It did not take long to realize why he was returned to the shelter. He would not sit still. If he wasn’t laying accross my neck and biting my nose, he was laying on top of Rose’s head and biting her ear. Rose used to tell people jokingly, “You can wear him as a scarf, you can wear him as a hat…” If the face biting wasn’t bad enough, he would see our toes move under the sheet and attack them. Ouch! Removing him from the bedroom wasn’t an option because he would cry at the door and worse, dig at the carpet. It was very rough for a while getting enough sleep. Even today, on his best day, he wakes us up at 5:00 a.m.
We tried every thing we could think of. I tried putting something in front of the door so he couldn’t dig at the carpet but then he would come around into the bathroom, which had two entrances, and cry and scratch at the door relentlessly. I would have closed the second door but the litter boxes were in there. We tried pulling the blanket over our heads so he couldn’t bite us but then it was like a game to him and he would work at digging his way in. I even bought a tube of calming gel but using it on Chris was like trying to calm a hurricane by blowing in the opposite direction. Eventually I felt like my marrage could be in jepordy if I couldn’t find a way for us to get enough sleep. This entry was posted in Uncategorized and tagged Bad Cat Chris, Bite, cat, Litter box, Pets, sleep on June 14, 2012 by Charles Huss.